The most competitive global companies use Salesforce.com to take sales and marketing activities to the next level. 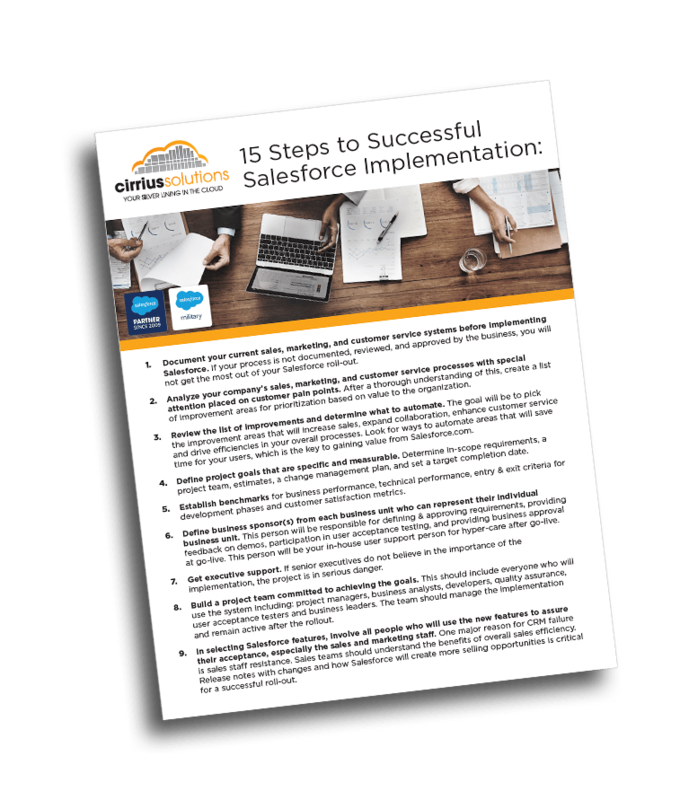 Cirrius Solutions is a leading Salesforce cloud consulting partner helping its customers, across every industry, redefine their sales, marketing, and customer service experience in the cloud. Our Salesforce Consultants use an Agile consulting model with 10 – 60 day deployment cycles to deliver results quickly. Cloud computing is the new paradigm for companies to access flexible, reliable and scalable computing power over the internet. This new delivery model calls for a new generation of agile consulting firms to help clients leverage the cloud for rapid, more granular application development. The Salesforce Service Cloud implemented by our seasoned experts will transform your service cases from a maintenance event to a revenue producing touchpoint opportunity. We know, from experience, that your customers are not willing to wait for service support. They want it immediately and they are willing to pay a significant premium for an immediate response. The new generation of users expect service to be provided 24/7 via their preferred channel. Service organizations must deliver exceptional, high-touch service with short wait times, high first-call resolution, extended support hours, and access to experts around the clock or risk losing a client to the competitor. Let Cirrius Solutions help with your digital transformation. We provide cloud-based equipment finance software that provides lease and loan management for the entire lifecycle of the contract. If you are experiencing too many data entry errors, have disparate business systems, high maintenance cost, poor organizational collaboration, and difficulty reporting we can help! Our solutions are provided on the world’s leading CRM solution Salesforce ™ with a full suite of customized solutions to help lessors save time, reduce costs, optimize revenue and manage risk. 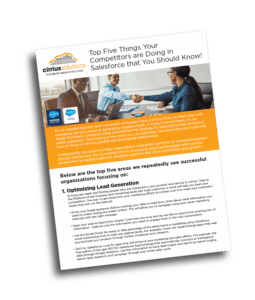 Whether you are a current user of Salesforce.com with advanced Marketing Automation or just starting to consider the platform,we can help you achieve success through revenue-based performance management. Cirrius consultants can assist with marketing systems selection, implementation, and sales & marketing alignment. Our Solutions Services teams can help you evolve your marketing organization into the digital world. 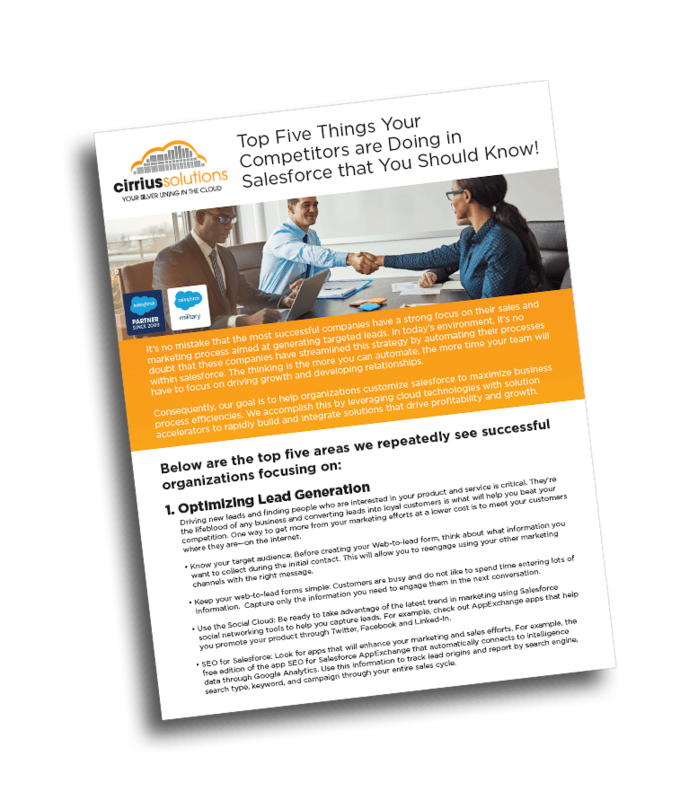 This transformation allows you to take advantage of the power of Salesforce by creating a 360 degree view of your customers through various marketing automation platforms. Cirrius Solutions is the leader in creating user-friendly, cloud-based solutions for managing both patient and laboratory data in the healthcare and life sciences industries. Our Salesforce consultants will show you how to deploy simple technologies to save time so that you can focus on helping your patients. We will show you how to modernize the customer experience using portals for easy interaction with providers, test results, upcoming appointments, needed medications and real-time messaging. Salesforce is the world’s most secure cloud computing platform trusted by millions of users including many in the life sciences and healthcare industries. The Cirrius team can help you create tailored solutions for your unique environment that will provide a truly modern patient experience.